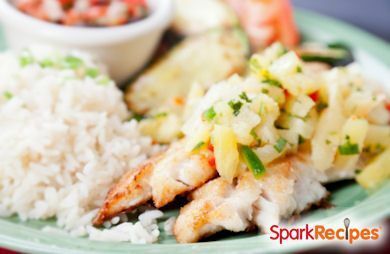 Citrus and cilantro dress up grilled fish. Citrus and cilantro dress up grilled fish. Serve this with brown rice or whole-grain tortillas warmed on the grill, along with a salad or steamed vegetable. Meanwhile, prepare the cilantro sauce by pureeing all the ingredients in a blender until smooth. Transfer to a small bowl and set aside. Segment the citrus fruit. Start by slicing off the rind and the pith (white part) with a knife. Once all the white pith is removed, hold the fruit over a medium bowl as you make V-shaped strokes with a small knife in between each membrane to remove the fruit. Squeeze the remaining membranes to release any leftover juice. Stir in the salt, cilantro, and salsa verde. Brush the hot grill to clean the grates. Season the fish with salt and pepper. Grill for two to three minutes per side, until the fish flakes and becomes firm. To serve, place 1/2 cup citrus salsa on a plate. Top with a piece of fish and drizzle on one tablespoon cilantro oil.